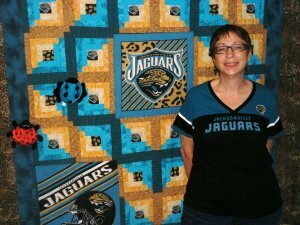 Rikki Jameson opened Ladybug Quilt Shop in November of 2009. She’d reached a point in her life where she was ready to share her love of quilting by teaching this skill to others in her community. Rikki has always enjoyed working with fabric and finds great satisfaction in helping her customers to develop their own sewing skills as they utilize her fabrics in their own designs. Ladybug quilt shop is dedicated to providing the highest quality service to the target market of quilters. They only carry the best fabrics and quilting supplies, and new stock arrives daily. They also offer a variety of quilting services that include innovative classes and Longarm quilting. Whether you are a beginning quilter or a skilled veteran, you’ll find exactly what you need at Ladybug Quilt Shop.